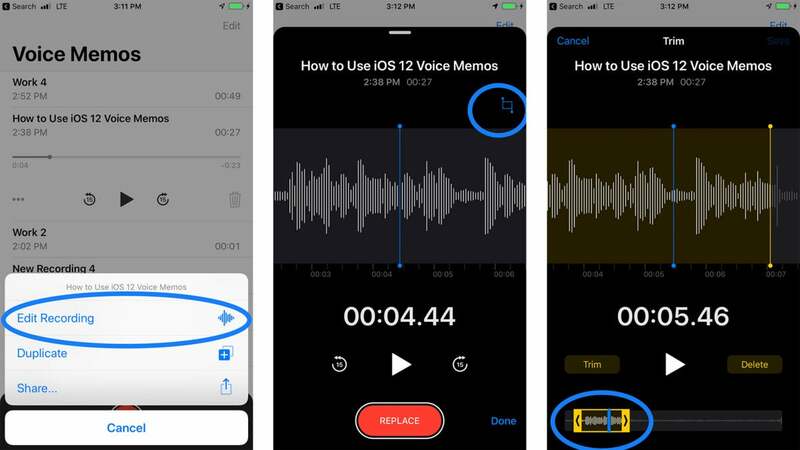 Apple's native Voice Memos app looks simple, but with iOS 12, it's surprisingly versatile. 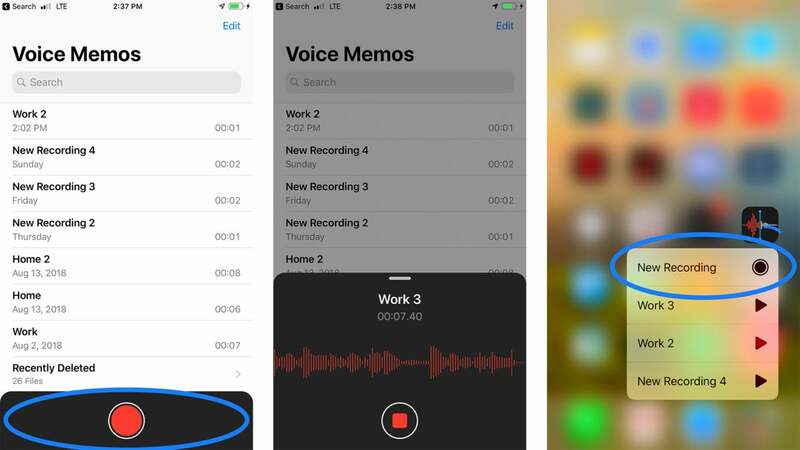 The Voice Memos app is one of the underrated gems of iOS’ stock apps, and Apple is giving it a much-appreciated makeover with iOS 12. It wasn’t bad before, but the latest update manages to transform it into both a useful recorder and audio editor without significantly changing the interface. Recordings even get uploaded to iCloud now, making it easy to import recordings into GarageBand or access them regardless of whether you’re on your iPhone, iPad, or Mac. It’s more useful than it probably looks. As a journalist, I find a good voice memo app is essential for everything from recording interviews to quickie article notes while I’m on the move. You, though, might find it useful for making quick remembers for what you need to pick up at the store. Regardless of the reason why you use it, here’s how to use it. A quick note: You may not see all of these options depending of which iPhone you’re using. The “Insert” function, for instance, never appeared on our iPhone 7 Plus or 2018 9.7-inch iPad despite a succession of various iOS 12 patches, but we could always find it on the first-generation iPad Pro and the iPhone X. In most cases, the features pair up just fine. At the most basic, simply open the app, and hit the big red circle at the bottom of the display. Say whatever you want to say, and then press the big square button. The app will immediately save your file with the title “New Recording” in a list above red button, and you can play these files back by tapping on them and hitting the Play button. Essentially, that’s how Voice Memos has always worked. You can also start a new recording by using Force Touch on the app icon and selecting “New Recording.” The recording will start immediately. With iOS 12, you have a few more options, particularly if you want to keep recording while using the same file after you’ve paused. Open the app as normal, but this time swipe up on the black bar with the red circle. If you swipe up on the black bar with the red circle only a small amount, you’ll see the stop button along with the file name, a timer, and a waveform. 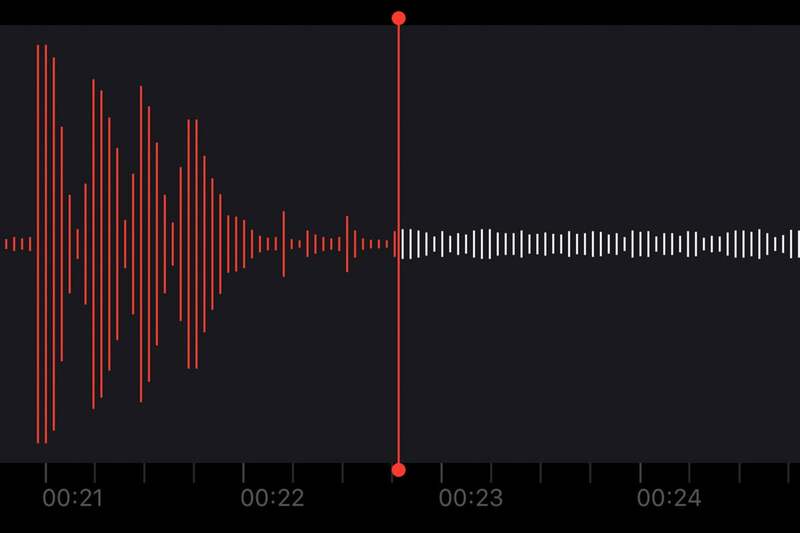 Swipe up on the black bar all the way to the top of the screen, and you’ll also get the current time, a more detailed waveform, and most importantly, a Pause button. Press the Pause button to stop recording. Optionally, you can also trim this clip using the tool in the upper right (or upper left, depending on which phone you’re using). See below for a more thorough explanation of trimming: The process is the same regardless of how you access it. Click Done, and the file will save. 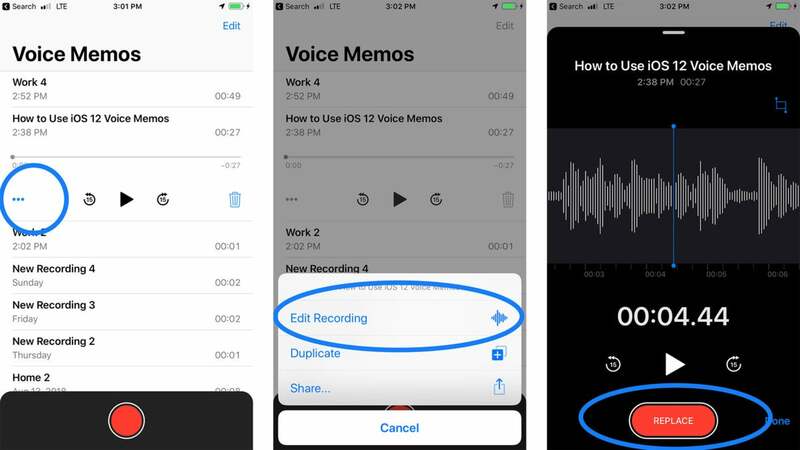 Voice Memos in iOS 12 offers two main methods of editing your voice files. As we’ve already seen, you can simply record over something with the “Replace” tool, but you can also trim them and insert new audio into the file. Here’s how to do each. This is a useful tool for when a single phrase (or sequence of notes, if you’re recording music) needs to be replaced for clarity in a recording that’s otherwise fine. Navigate to the file list (visible by simply opening the app). Select your file of choice. Click the More Options menu (the three dots) in the lower left. Press the Pause button at the bottom to stop recording. Scrub back to where you started the replacement and press Play to see how it sounds. Click Done if happy with the results. This is useful for when you only want to save a specific section of a recording (likely for ease of sending it to someone else), or you want to remove sensitive information before sharing an audio file. You’ll see the same menu as before, but press the blue Trim tool in the upper right of the interface (or upper left, depending on which iPhone or iPad you’re using). It looks a bit like the Crop tool in most other apps. The waveform interface will open. At the bottom, you’ll see a waveform representing the full length of the file, much as you do when editing a video in iOS. You’ll see a yellow bracket over the whole waveform, with arrows pointed outward. Pull in the edges to the section of audio you want to work with, and options to either Trim or Delete will appear. Pressing Trim will delete everything except the audio you have selected. Pressing Delete will delete the selection itself. Press Save in the upper right corner. 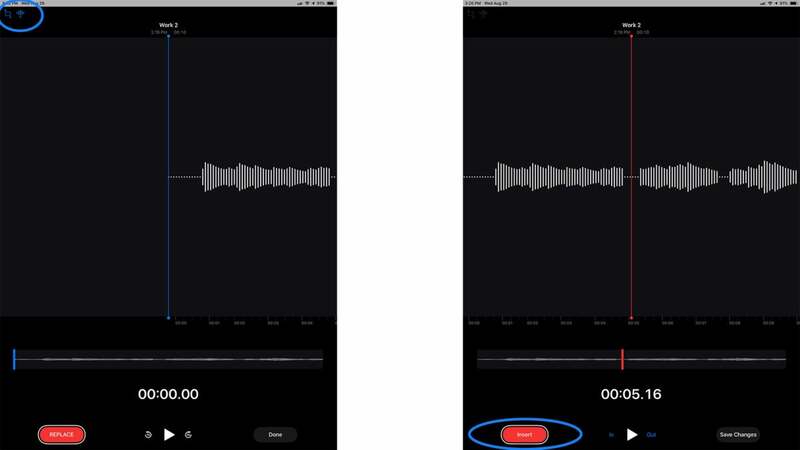 With iOS 12, you can now insert new audio in the middle of existing audio. 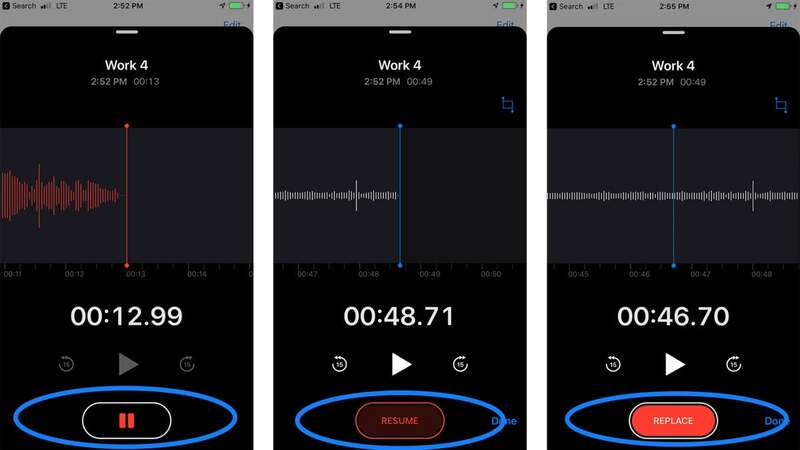 This is particularly useful if you’re using Voice Memos to compose music and you need to insert a new string of notes, or when you’d like to make a note to yourself before a key quote in a recorded interview. It works similarly to Replace, but in this case you’re adding audio rather than recording over it. This feature doesn’t appear on all iPhone or iPad models, so in this case I’m using an iPad Pro to illustrate it. If you’re on a iPhone or iPad that supports Insert, you’ll see the crop tool run the upper left of this screen along with a stylized diamond immediately to the right of it. Click on the diamond. Once you’ve found the right spot, click the big, red Insert button at the bottom of the screen. Once you’ve inserted the audio you want to include, press the Pause symbol.